This morning, after dire warnings of being left behind in Corsica if we are late getting on to the bus, we are all front and center, in our places (with bright shining faces) in the vans and on the way to the ferry. The ferry took about a hour to make the crossing to Sardinia. 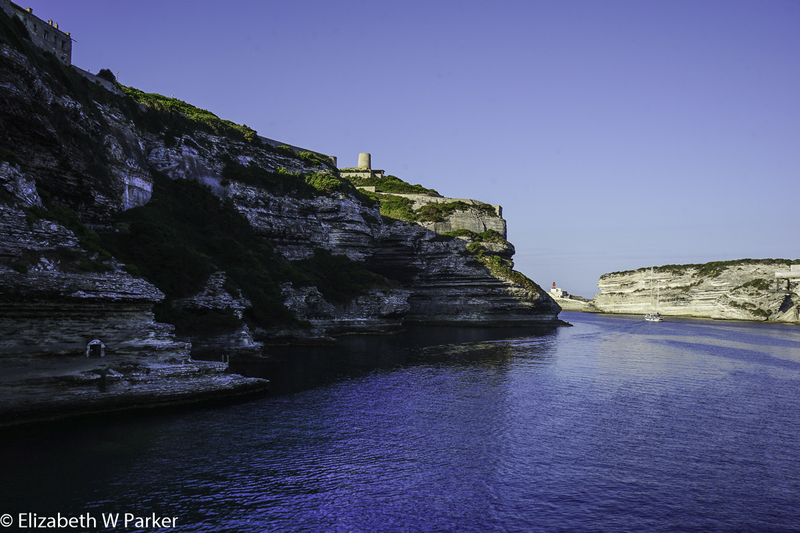 During the entire trip we could still see the sandstone cliffs of Bonifacio and the areas we hiked yesterday. It is more than a little sad to leave. Gerry and I have been in Corsica for a week. I have loved the friendly people, the fresh food, speaking French, deciphering Corsican, and the scenery. Above all, the scenery. I look forward to going back. We disembarked at the little resort town of Santa Teresa di Gallura. Here, we parked our vans at the Bocche di Bonifacio restaurant and began what will be everyone’s favorite day hiking among the bounders of Capo Testa. We are at the northwestern tip of Sardinia and Capo Testa is a ginko leaf-shaped peninsula that bursts out of the coastline, connected only by a sand bar. Our first view of Sardinia! 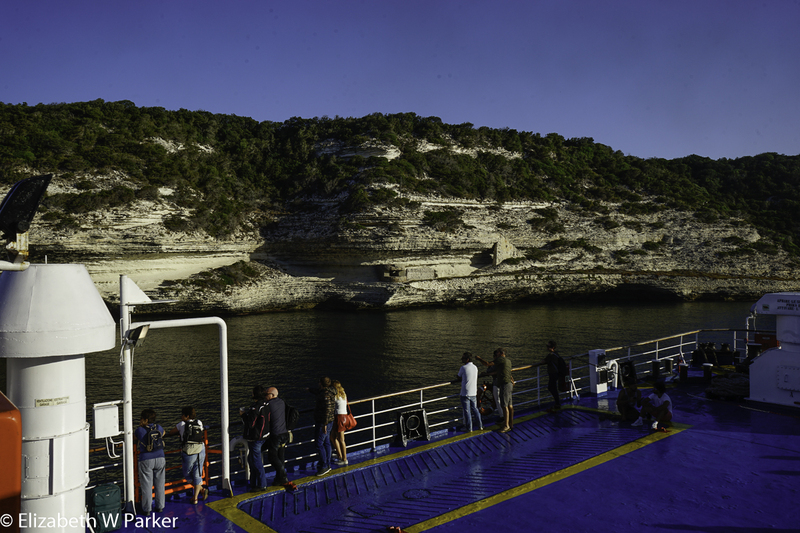 A nostalgic look back at Bonifacio, across the strait. Adieu, Bonifacio! 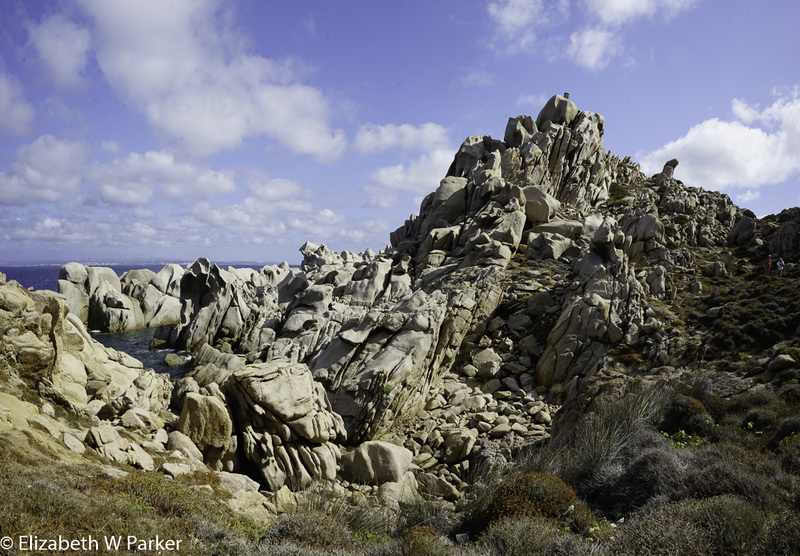 Capo Testa – the terrain is rocky! 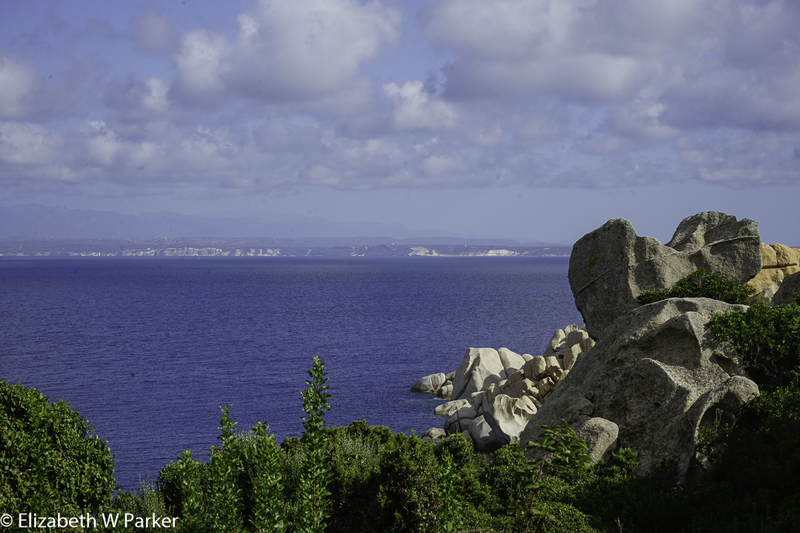 Capo Testa – VERY rocky! the funny shapes made by the rocks, as we used our imaginations to find all sorts of faces and animals. Though promised a swim, when we arrived at the beach we found it pretty crowded. The beach was in an area inhabited by “hippies,” pretty scruffy looking squatters who appear to have created their own little village of tents and cave homes. There was a creative totem pole resplendent with skulls, real and home-made, and some residents proffered artisan wares for sale. Here was also a hopeful, but rather lazy (unattended), hat near the entrance; the bottom dappled with coins – I guess you can just donate if you feel so inclined. From the hippie beach (the local name for it, not mine), we left the area via a stone quarry used by the ancient Romans. There was no doubt that human hands had carved these blocks of stone with their right angles and boxy shapes. We also got a close-up look at the method the Romans used to “cut” the enormous slabs they would load onto ships waiting on the beach for transport to the Eternal City. A perfectly straight line of deep chisel cuts marked the line along which the stone would be broken. Pieces of wood inserted into the chisel cuts would have been soaked with water, and as they expanded would pressure the stone to crack along that line. It was remarkable for its precision. To regain the road and walk back to the vans, so we could go to lunch, we had to squeeze sideways through scrub that is now as high as our shoulders. That stuff really loves to grab your clothing and try to trip you, (maybe even swallow you up), but I can report that all made it safely to the top! Our lunch was a fish feast, back at the Bocche di Bonifacio. The family who owns the restaurant is a fishing family so everything we ate was that-day-fresh. Simply prepared (grilled or boiled or fried), the basic condiments of oil, vinegar and lemon were all we needed to enjoy the bounty. We also partook liberally of the wine – we have a 3 ½ hour bus trip to Alghero this afternoon, so why not? During the bus trip, most people snoozed. I wrote some of the earlier sections of the blog, trying valiantly to get recorded at least the basics of the trip and the things we have done while they were still relatively fresh. Valiant but in vain! It has been a very difficult on this trip to find the time to record my thoughts, as we are scheduled very tightly from reveille to taps. 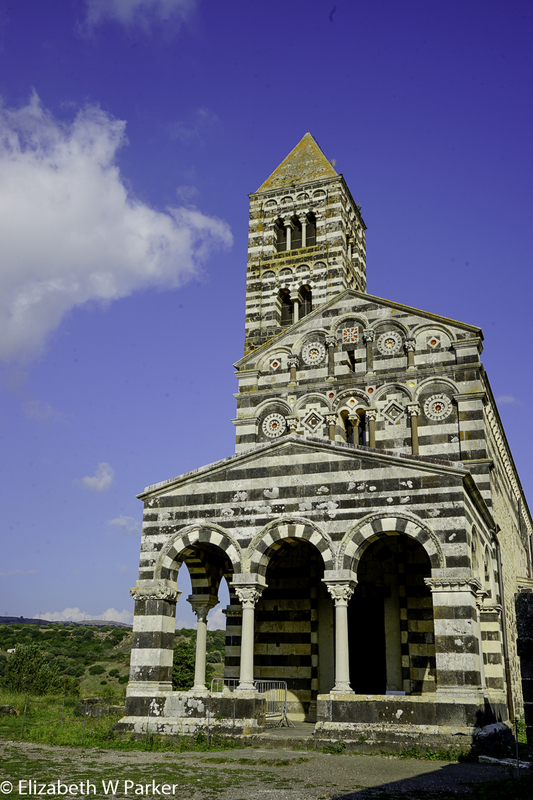 About two-hours along the way we stopped to see graceful medieval church, Santa Trinita de Saccargia (11&12 c), with its zebra-striped facade, interior frescoes, and bell tower. I was intrigued and fascinated by this church. What in the world was such a building doing out in the middle of nowhere? There is, of course, a legend involving a couple who wanted a child and promised to build a church if only God would intervene. They got their heir and fulfilled their promise. 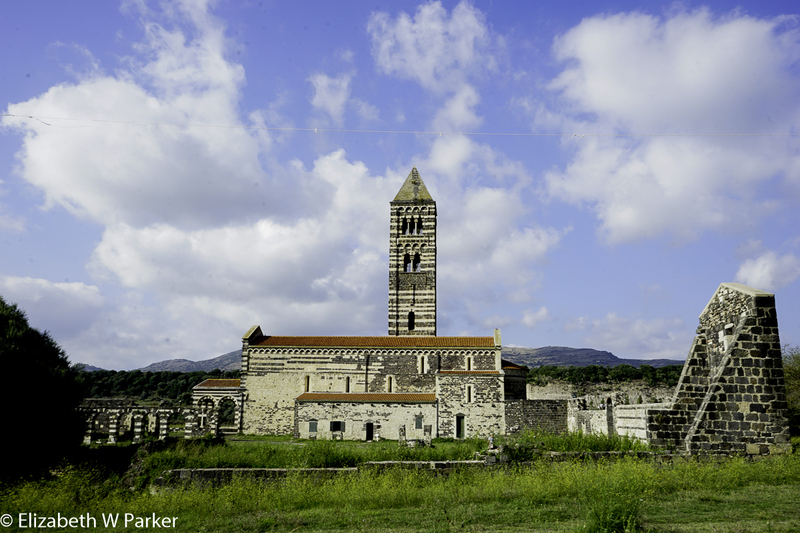 A monastery was also built here, predating the church, but very little of it survives. If there was a surrounding town, it is also gone. The only other human activity here was a coffee shop and a pay-to-play restroom. Striking, of course, is the black and white striped decoration, bringing to mind the great churches of Florence. This church was envisioned in the same way, but here in Sardinia, black stone (basalt) is available and green would have had to be imported. The black was perfect, I thought. It was less formal, fitting for a country church, and a little gloomy, fitting for a church whose glory days are far in the past. I also like the fact that the black and white stones, basalt and limestone, are both found nearby. Wonderful capitals on the loggia columns have images of animals, peculiarly, cattle. Some etymology of the word saccargia comes from s’acca argia – a dairy maid, perhaps? It would explain the capital’s iconography. Back in the vans for another hour, we arrived in Alghero just about dusk. Our hotel in Alghero is a multi-story building in the center of town, called the Hotel Catalunya. This part of Sardinia was under the control of Catalunya and there is evidence of the Catalan influence in both the language and the food. The rooms are okay, but the standout of this hotel is clearly the view, from most of our rooms and from the terrace on the ninth floor (bar by night and breakfast room by day). The old city is just a few blocks away, so the hotel was chosen for its location. On this, our first night here, we have a free night to find our own meals and entertainment. We set out for a pizza place not far from the hotel, but it was a no-go without a reservation. However, the head waiter actually called a sister restaurant in the old city for us and got us a table for 7. Following his directions we entered the narrow, irregular streets of the old city and after a couple of turns found ourselves on the main drag to the cathedral. Our dinner, arranged by the accommodating waiter mentioned above, was at La Bifora, where we were seated outside in a large piazza. We were 7 and most had pizza. We also had two bottles of local wine, one was good, the other exceptional. Gerry and I took a short spin to the cathedral and the marina before heading back to the hotel. I mentioned the view from our rooms and the terrace. Here are a couple of shots at different times of day. It had a feel like Morocco – I loved this view! 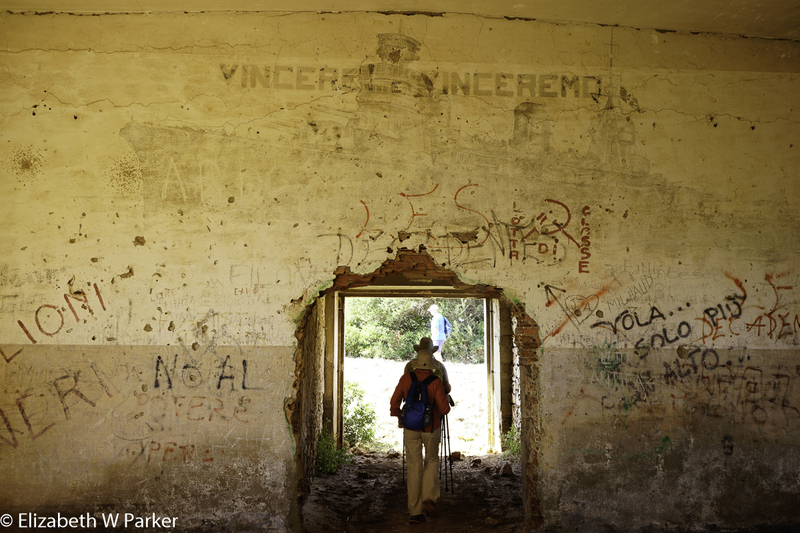 Today’s hike took us to a natural area to see some remains of the military emplacements from WWII. The walk took us through forest vegetation, tall pines, bracken ferns, and of course the macchia. 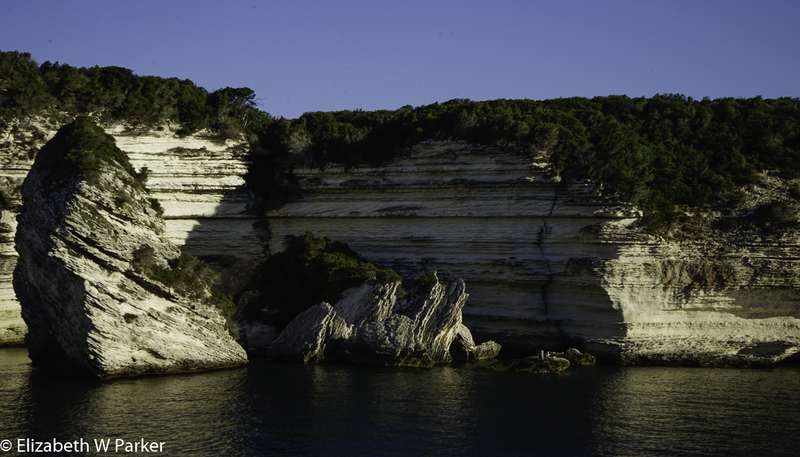 The cliffs here are called Punta Giglio. On one high, coastal point we found the base of an anti-aircraft gun. 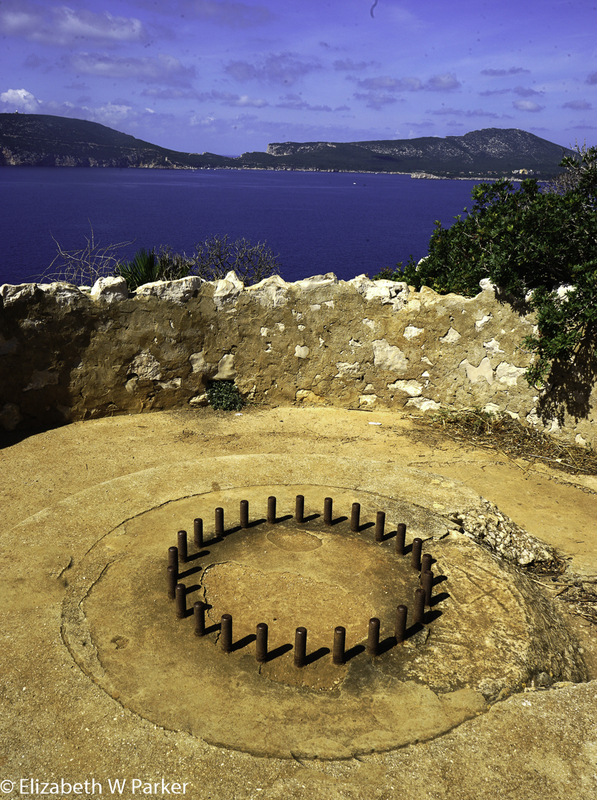 It was well-placed, with a commanding defensive view toward Capo Caccia to the north (where the Grotta di Nettuno is), and the full coastline to the south, a string of bays. The water around the base of our cliff is gorgeous deep blue, the sun is brilliant and the sky clear. A beautiful day in Sardinia! The view to the south from the anti-aircraft gun. Good defensive position. Walking a little farther along our route we came upon the barracks used by Italian (Fascist) soldiers awaiting the arrival of the Americans. Though the building is pretty much a wreck, there are still graffiti and Fascist slogans on the walls. The end of our hike was down next to the water. We had a chance to swim. Today, I brought my swimming suit in my backpack and had to change into it, but it was so worth it to get into that water. We cooled off yes, but it was so refreshing to move our legs in a different way from the walking and work all the kinks out. We also had a picnic lunch in a little grove of trees above the beach, before a short, hot walk back to the vans. 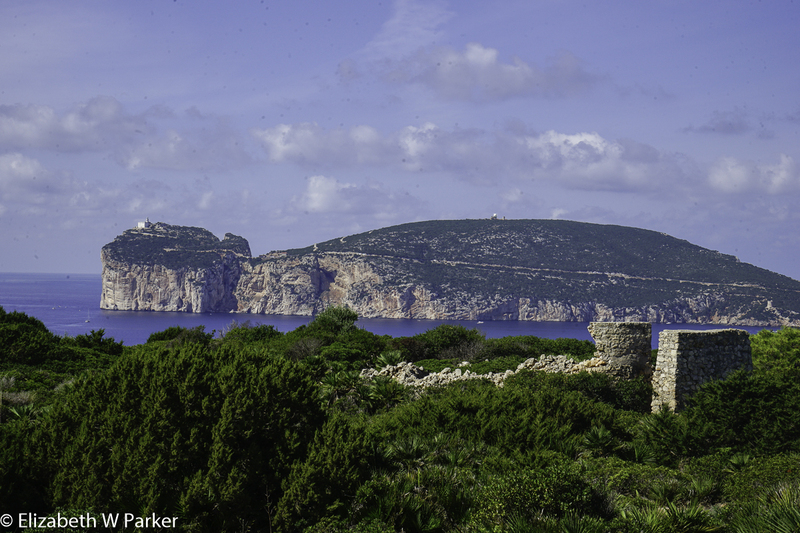 Our next stop is the Grotta di Nettuno – maybe a 30 minute drive around the bay from where we are to Capo Caccia, we could see it from our hike. 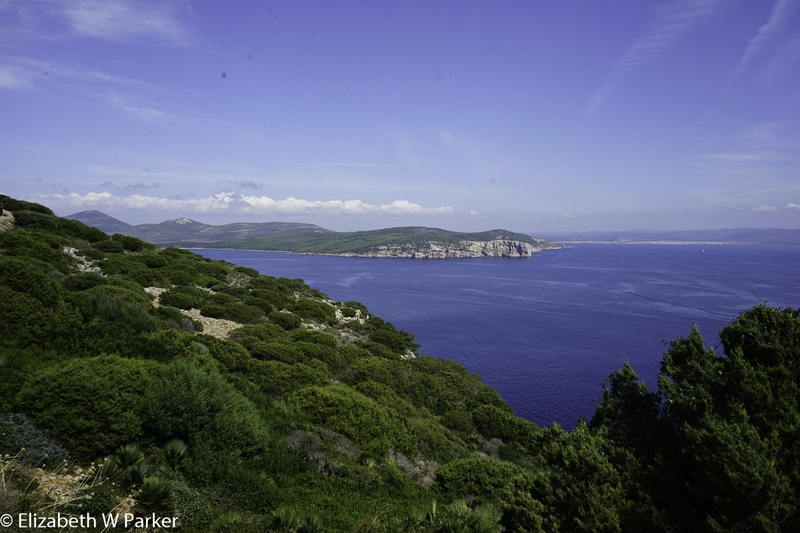 That is Capo Caccia – from Punta Giglio. Sardinia. Racing against time to make a 3:00 tour, we practically ran down the 700 stairs from the ticket office at the top to the old ticket office at the bottom to visit the cave complex called the Grotta di Nettuno. The tour was walking along a proscribed path in the grotto with narration in Italian, English and German. Compared to other cave systems like these we have seen, this was not the most impressive and yet the age of the grotto and the size of columns inside was awe-inspiring. It is also very scenic with water still in the caves. It had been a long day and I knew that I would never make it back up those 700 steps on the outside of the cliff. 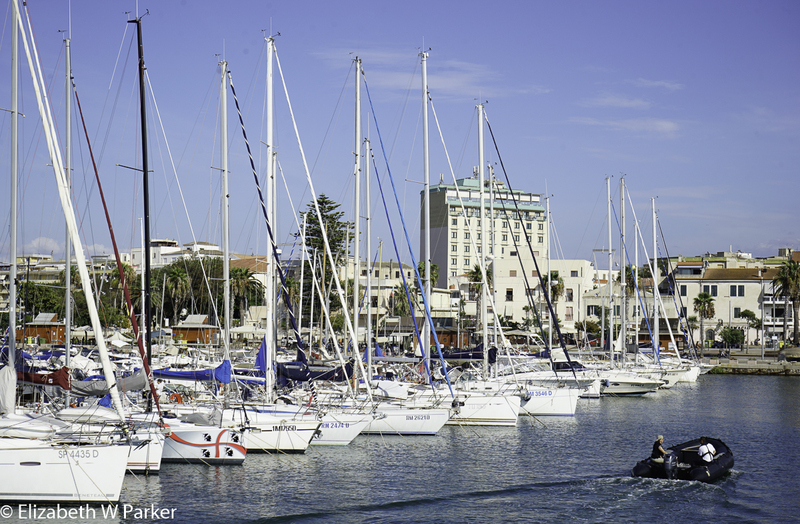 Fortunately, a boat was on hand to take all the visitors back to Alghero by sea. What a relaxing way to end the day. The bonus, of course, was being able to see everything from the water! For dinner, the whole group went to a restaurant right across from the main cathedral. Again the “bicycle” lanterns were absolutely enchanting. The restaurant, Sartoria del Gusto, had interesting displays in the indoor dining room. Collages of fabric, clothing designs and notions and recipes for traditional Sardinia dishes were placed on the walls like artwork. Interesting analogy, right. sewing and cooking? Our food was delicious and the wine excellent. I was able to talk with one of our guides, Mariangela, a young Sardinian woman recently recruited to the Wilderness Adventure guiding staff. We traded stories about our respective families and I got to practice some Italian. After our dinner, about 5 of us including 2 of our guides, took a walk through the town, out to the famous ramparts of the medieval walls, referred to as the bastioni (ramparts), enjoying our paseggiata (stroll) on a Saturday evening. Tomorrow we will change locations again. I hope you are enjoying the blog so far. Stay tuned – there is still more to come.